Social worker and reformer Julia Lathrop was nicknamed "America's First Official Mother" for her devoted work in bettering the conditions for the often-neglected members of society: children, the mentally challenged, and the disabled. Yet Lathrop understood early in her career that caring did not suffice in heralding real changes in the torrid living conditions of the people she sought to help. Lathrop declared, "The era of rule by thumb and a kind heart must give way to trained individuals, whose kindness of heart is rendered more effective because [it is] governed by intelligence." Praxis was everything for Lathrop; her methodical work and hands-on dedication to her work reaped significant improvement in poverty and childcare reforms in the United States and abroad. Julia Clifford Lathrop was born in 1858, in Rockford, Illinois. She attended Rockford College for two years before entering Vassar, graduating in the class of 1880. At Vassar, Lathrop conceived her own "disciplinary training," studying statistics, institutional history, sociology, and community organization. Her interest in multidisciplinary studies would eventually manifest itself in 1924 in the School of Euthenics at Vassar, which Lathrop helped to develop with trustee Minnie Cumnock Blodgett, drawing on the ideas of Ellen Swallow Richards '70, who had coined the term and defined the discipline. Lathrop's father, attorney William Lathrop, was quite active in politics (and a friend of President Lincoln) and drafted the first bill allowing women to practice law. After graduation, Lathrop worked in her father's firm, acquiring knowledge about the working of the law. In 1890 Lathrop moved to southwest Chicago, a notoriously poor section of the city, to work under Jane Addams at the Hull House, a settlement home for immigrants and the poor. Lathrop undertook an extensive survey of the residents' environment and welfare to expose the abysmal living conditions of the area. Her findings were compiled into the "Hull House Maps and Papers." In recognition of her work, the governor of Illinois appointed Lathrop to the State Board of Charities in 1892. The next year Lathrop inspected numerous mental health organizations, orphanages, shelters, and soup kitchens on behalf of the Illinois Board of Charities. She also visited all 102 poorhouses in Illinois, and in 1899 she established a juvenile court in Chicago, the first court of its kind in the United States. In 1912 President Taft appointed Julia Lathrop chief of the newly formed Children's Bureau in the Department of Commerce and Labor. The first woman to be made bureau chief in US history, Lathrop worked for the bureau until 1921. Under her leadership, the Bureau worked to tackle major problems such as infant mortality, poor nutrition, and juvenile delinquency. After the Keating-Owen Child Labor Act was passed in 1916 (prohibiting interstate commerce of goods manufactured by children), a Child Labor Division was created in the bureau to enforce the Act. Lathrop, along with the Bureau, was also highly involved in the lobbying for the Sheppard-Towner Act (passed by Congress in 1921), which allotted federal funds to states to create programs for maternity care. From 1918 to 1919 Lathrop served as President of the National Conference for Social Work. 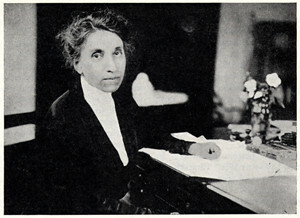 She also served on the Vassar Board of Trustees from 1912 to 1918. In 1918 after the armistice of World War I, President Wilson sent Lathrop and another social worker, Grace Abbott, to Europe for an international conference on child welfare. Lathrop became instrumental in the formation of a childcare bureau in the newly formed country of Czechoslovakia. In 1925, Lathrop again traveled to Europe on behalf of the United States, this time to Switzerland for the League of Nations Childcare Commission. Lathrop traveled extensively to call attention to the plight of impoverished children, factory workers, and the mentally ill. Though she was often on the road, Lathrop always returned home to her birthplace of Rockford, Illinois. She died there in 1932. Julia Lathrop is recognized as one of the many Vassar innovators. Addams, Jane. My Friend Julia Lathrop. New York: The MacMillan Company, 1935. Feld, Rose C. "Jane Addams wrote this Biography of Julia Lathrop," NY Times Book Review, Dec 8 1935. Newell. Mary O'Connor. "America's First Official Mother," Chicago Sunday-Record Herald. May 19, 1912. "Report of the Secretary of the Board of Trustees", Vassar College, 1931-32.